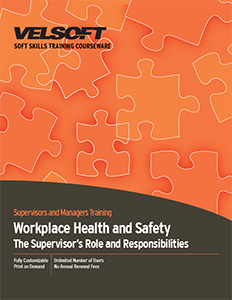 Seeing is Believing This sample manual to teach Workplace Health and Safety: The Supervisor's Role and Responsibilities is in MS Word format. Workplace Health and Safety: The Supervisor's Role and Responsibilities is a one-day program that introduces your students to the skills they need as supervisors to participate effectively in health and safety responsibilities. Students start the course by looking at the workplace health and safety experience, worker rights, and supervisor and worker health and safety responsibilities. They will progress to a consideration of health and safety committees, hazard identification, assessment, and control, and then move on to look at employee competency. The last two sessions take a look at accident reporting and investigating, and communicating health and safety information.